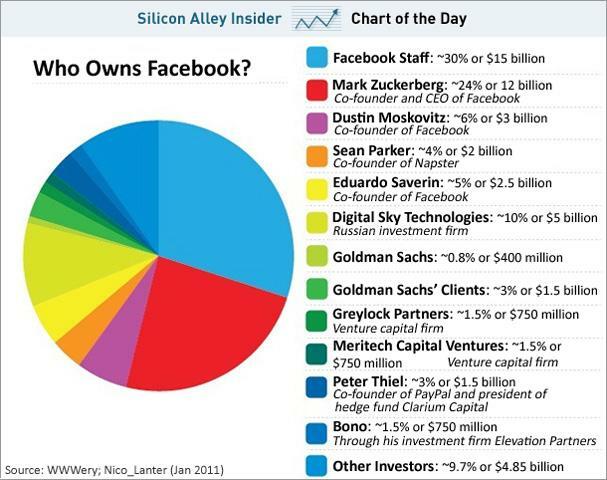 Here is a chart showing Facebook ownership breakdown as of year-end 2010. With a $50 billion Facebook valuation, when this company goes public with its IPO anticipated in 2012, there will be a few billionaires added to the world's list of the rich and famous. The recent injection of investment funds into Facebook by Goldman Sachs to obtain an 8% stake in the company pales in comparison to the largest ownership by the staff at 30%. Stock market articles and stock charts can be found in the stock market segment of this website.